The hazards of winter driving are obvious. In fact, 2019 already got off to a deadly start, as one person was killed in a devastating pileup that happened on the New York State Thruway near Buffalo. Lake effect snow was the environmental factor that lead to the crash. 24 percent of weather-related vehicle crashes. Over 1,300 deaths and more than 116,800 injuries. 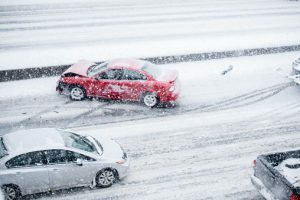 Heavy snowfall isn’t the only culprit behind winter-related auto accidents. After a massive snowstorm, it’s common to experience blowing snow and whiteout conditions caused by strong winds. This can obstruct visibility and lead to a serious crash. Even when the roads aren’t covered in snow, fluctuating temperatures can result in black ice. This occurs when snow or ice melts after temperatures rise above freezing. When the temperatures drop at night, the roads may freeze in some spots – especially near overpasses. What You Can Do to Protect Yourself. Never mix radial tires with other types of tires. Avoid using your parking brake. Increase following distance to 8-10 seconds. Don’t stop when going uphill. No matter how safely you drive, you cannot account for the actions of other motorists. If you’ve been the victim of a personal injury accident in the Buffalo area’s legendary winter conditions, you may feel helpless. You may be injured and unable to work or provide for your family as the bills pile up. An insurance company may be pressuring you into accepting an inadequate financial settlement because they know you are desperate. Protect your rights. Personal injury lawyer James E. Morris and his legal team have decades of experience representing people just like you throughout western New York. They know the hazards of winter driving and they know how to stand up to the insurance companies. Contact us today for a free initial consultation. You don’t pay a cent unless we win your case.